Learn how to manage all booking, assign drivers and control payments. Latest – here you will find the the bookings which need the operator’s most immediate attention. All new bookings appear in this tab. Completed – all completed bookings are moved to this tab automatically and will be kept here as long as it’s needed. Canceled – bookings that have been cancelled are moved automatically to this tab. All – in this tab all bookings are visible in chronological order, no matter their status. Add New – allows the admin to create a new booking. Every reservation contains all the particulars of a booking: the Journey Details, Reservation Details and Customer Details. Learn how to track a booking progress, HERE. After entering a chosen reservations tab (Latest, Completed, Cancelled, All) you will be able to choose from a multitude of actions from the menu. Reset (left arrow symbol) – resets the column order to their default positions and setting. Refresh (right-left arrow symbol) – if you wish to refresh the system, you can do that at any moment with the third symbol. The admin panel does however have an automatic, 60 second refresh mechanism anyway. You can set the refresh time to a custom value by going to Settings, then Booking, Booking Listing Refresh and pick a desired “Refresh time”. The minimum being 30 seconds. The Filter is a very helpful tool that assists you in finding the data of a specific group. The search can be conducted in one or many data groups: Source, Status, Payment method, Payment status, Driver, Customer, From, To, Data Type. Combining more options together will narrow the search results and help you reach more specific results. Send Invoice to selected customers via email. 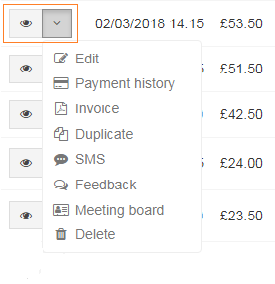 Reports button – to create a new financial report, go to Filter/Search and choose a filter from the pop-up menu on a given column. Then confirm your choice with the Reports button in the main menu. Payment Report – a analysis of data for each separate payment method (Cash, PayPal, Credit Card) or all of them together (All Payments). Use the Reset button to cancel all filters and go back to viewing all bookings. Add New Booking (green button at the top) – Once clicked, a new form pops up, allowing you to create a new booking. View (eye symbol) – get a quick look at all the booking details. Invoice – the system will automatically create an invoice for the chosen booking. You can download the invoice to your drive or print it. Delete – think twice before using this one, it deletes the booking from the system and it cannot be recovered once deleted! All bookings details are divided into groups which you see in the panel as columns. We know the panel is your working space, a sacred space. Make it your own! That is why you can adapt and alter the columns order in any way you see fit. All available columns that can be added to your main view are listed in the Column Visibility section. You can choose from a really wide variety of alternatives. All in all, that’s over 30 options! Your setting will be saved in the browser.